The Photogenic CL500K Photoflood Tungsten 2-Light Travel Kit is ideal for all photo and video applications. The CL500 has a heavy-duty ceramic socket and vented housing with a whisper-quiet fan for sound recording with low noise requirements. Each fixture uses standard photoflood bulbs, up to 500W (included). 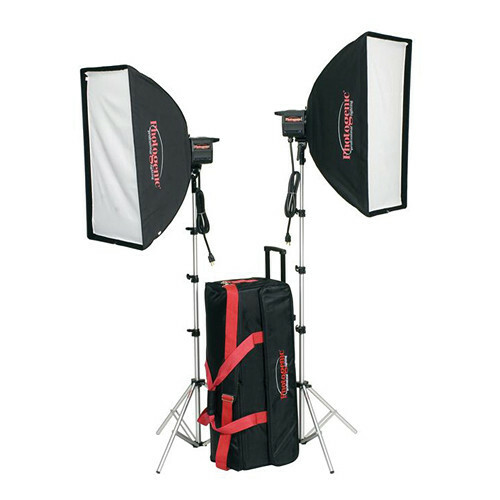 This two-light kit includes 8' light stands and a soft case to ease transport and storage. Lever mechanism allows easy lock-on of a wide range of reflectors, special high-temperature softboxes, umbrellas, and other accessories. Uses 7, 14, 16, 20, and 24" reflectors. The rugged aluminum housing can handle rigors of location/studio use and is fan-cooled. Ideal for use in all digital lighting applications, studio lighting, portraiture, tabletop lighting, and video lighting. Box Dimensions (LxWxH) 36.0 x 14.0 x 11.5"